TRADERS’ exhibitions are spaces and moments for exploring the issues and themes underlying participatory art and design in/for public space. 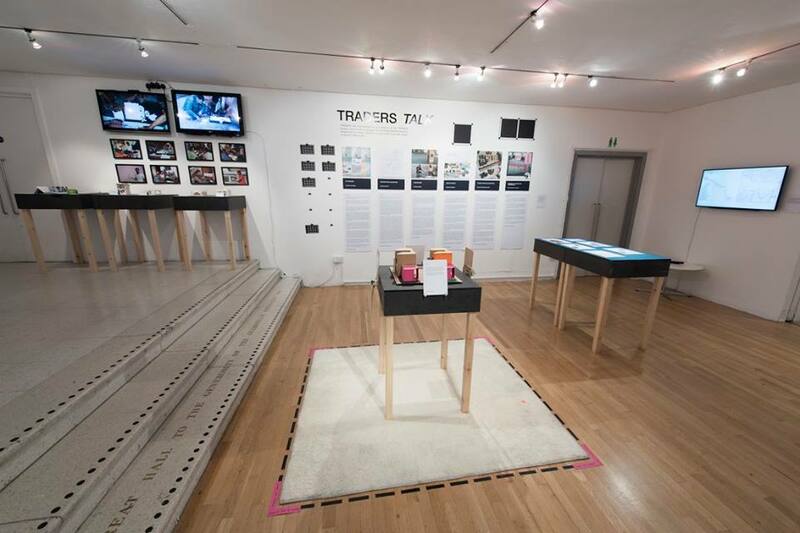 The main content of these exhibitions is sourced from the web-platform TRADERS Talk, an extension of the TRADERS project, which engages art and design practitioners and researchers in critical discussion and reflection through an online forum where projects are exhibited and critically discussed. Exhibited projects are selected and screened through a peer-review process involving TRADERS researchers, affiliated partners or others who are invited to be part of the editorial team. During an interactive exhibition session we will employ a co-curatorial approach in order to rethink theory through art and design practices. In this workshop small groups of participants will negotiate how different projects / practices can be represented in relation to each other and in accordance to a conceptual frame –namely, agency. This dialogical and co-curatorial process focuses on understanding the wider theme of agency through the convergences and divergences of art and design practices and approaches identified in a selection of projects from our platform TRADERS Talk. The workshop aims to unpack the notion of agency and expand its definitional contours by rooting it in practice and exploring it collectively through conceptual mapping. In the context of the TRADERS International Conference, we welcome contributions of projects (realized or in progress) which deal with the agency of art or design practice to challenge, transform or disrupt the status quo. The notion of agency in art and design practices refers to an action that aims to be transformative and has a level of influence in citizen’s participation (for further information on the notion of agency, refer to the conference call). In your contribution, please respond to the following questions: who were the main actors involved in the project and what was the role and relationship of the artist/designer with the other actors? How did the art or design artefact/act exert agency and/or mediate, challenge or disrupt existing power dynamics? What were the means or practices through which the artist/designer mediated between different actors and institutions? After a first screening, the selected projects will be published in the platform and opened for discussion. After a second screening, the authors of the selected projects will be invited to take part in an interactive session on the 21st and 22nd of November, when the different practices will be confronted and engaged in [critical] dialogues in line with the theme of agency. Submissions should be made via our web-platform TRADERSTalk using the tag #Agency in the submission form before the 30th of June 2016. Once you submit your contribution, it will be reviewed in the next 48 hours and published online if selected. The second screening will then take place, in which a selected number of projects will be chosen to participate in the interactive session during TRADERS Conference. For more detailed information about the exhibition, please contact Pablo Calderón Salazar – LUCA School of Arts, KU Leuven.